the next few years than it has over the past few years. On a fourth-quarter-to-fourth-quarter basis, real GDP is projected to increase by 3.1 percent this year, by 3.4 percent per year in 2015 and 2016, and by 2.7 percent in 2017 ... By the second half of 2017, CBO projects, real GDP will return to its average historical relationship with potential (or maximum sustainable) GDP ..."
In short, although the prediction is that the U.S. economy is roughly halfway from the end of the recession to a full economic recovery, this is a case where the glass is actually half-full, rather than half-empty, because the heartier period of economic growth is coming. Here are a few of the details. 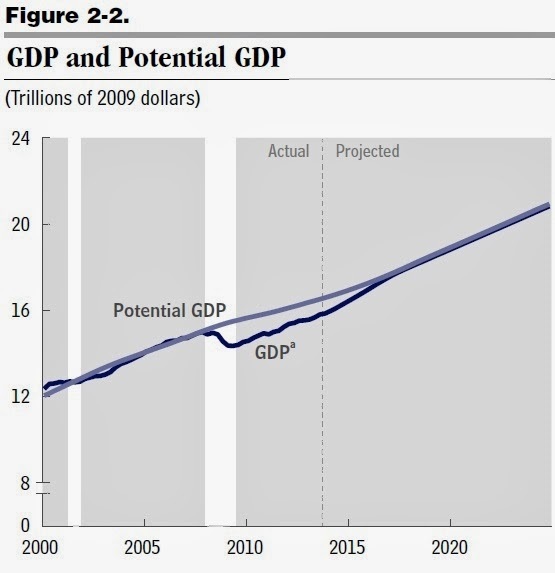 Here's a figure showing how the Great Recession reduced economic output below its potential, and the CBO projection for bounceback in the next few years. 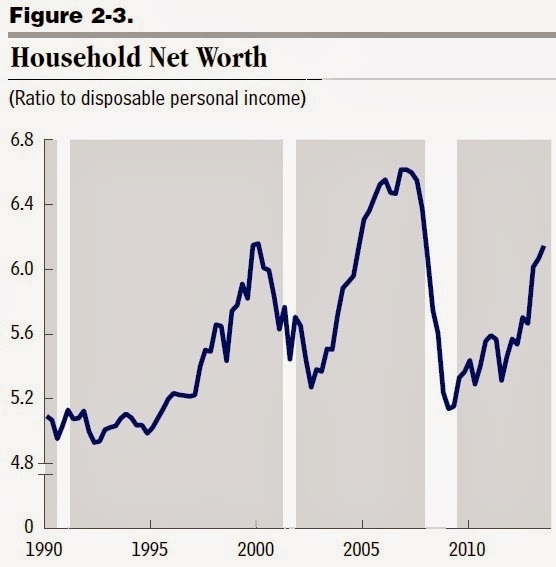 Household wealth relative to income, which took an enormous hit during the Great Recession from the double-whammy of falling housing prices and a falling stock market, has now moved back to higher levels. 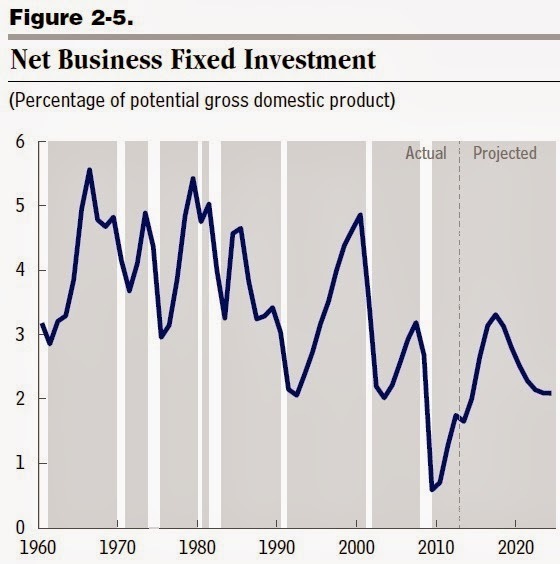 However, business investment hasn't only just started its bounceback, and the CBO projections suggest that it will be leading the way in the next few years. What about the unemployment rate and the labor market? The CBO has also just published "The Slow Recovery of the Labor Market" to tackle that subject. The grim fact here is that after the end of the average U.S. recession, the number of jobs takes a couple of quarters to start growing again. 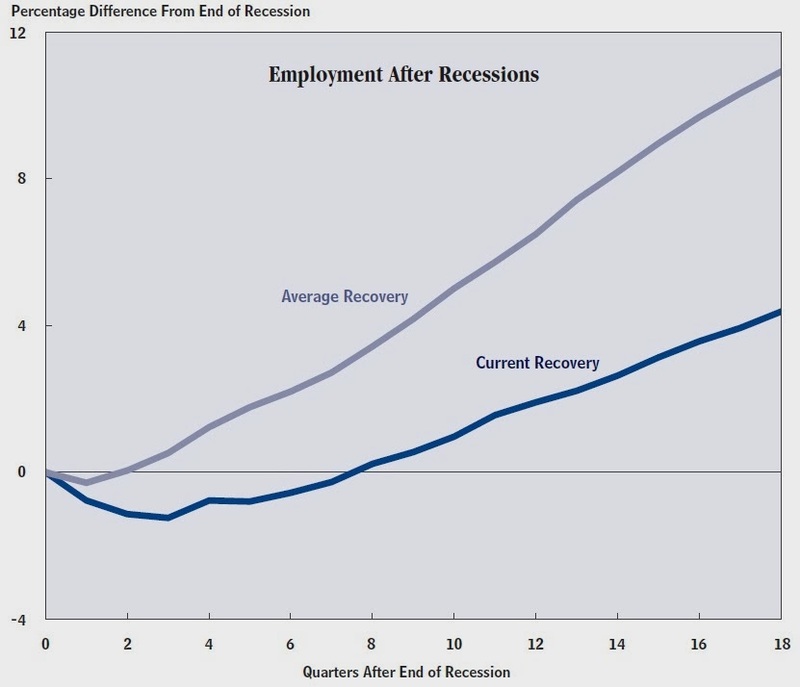 But after the end of the Great Recession, the number of jobs kept falling, and has been slower to recover (as shown by the flatter slope of the lower line in the figure). Of the roughly 2 percentage-point net increase in the rate of unemployment between the end of 2007 and the end of 2013, about 1 percentage point was the result of cyclical weakness in the demand for goods and services, and about 1 percentage point arose from structural factors; those factors are chiefly the stigma workers face and the erosion of skills that can stem from long-term unemployment (together worth about one-half of a percentage point of increase in the unemployment rate) and a decrease in the efficiency with which employers are filling vacancies (probably at least in part as a result of mismatches in skills and locations, and also worth about one-half of a percentage point of the increase in the unemployment rate). 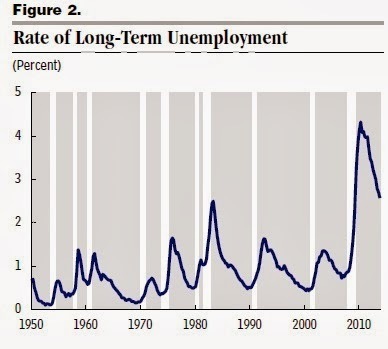 But even with the lower overall unemployment rate, the long-term rate of unemployment--that is, the unemployment rate where joblessness has lasted more than 26 weeks--remains historically high. Also, the share of U.S. workers participating in labor force has declined, which raises the possibility that at least some of them would have preferred to keep working, but became discouraged about their job prospects and gave up. 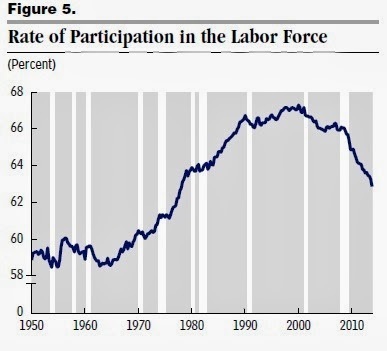 Notice, however, that the decline in labor force participation actually started back around 2000. It was fairly well-known among economists that as the period in which women were pouring into the (paid) labor force came to and end, and as the Baby Boom generation aged, and as a greater share of young people started to attend college, labor force participation rates would tend to drop off. Of the roughly 3 percentage-point net decline in the labor force participation rate between the end of 2007 and the end of 2013, about 1½ percentage points was the result of long-term trends (primarily the aging of the population), about 1 percentage point was the result of temporary weakness in employment prospects and wages, and about one-half of a percentage point was attributable to unusual aspects of the slow recovery that led workers to become discouraged and permanently drop out of the labor force.